Václav Havel grew up in a world of privilege, but it was a world of political engagement, where questions were asked, and where there was constant debate about the central issues of the day. His maternal grandfather was a prominent Czechoslovak diplomat, who embraced the ideal that then seemed hopelessly naive of an integrated Europe. In Václav's childhood we can see the roots of his career both as a writer and a politician. 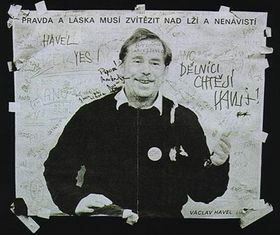 One of the popular images of Václav Havel abroad is of a poet who was swept - romantically, suddenly and almost unawares - from his literary ivory tower into Prague Castle and the world of political power. This is a simplification. Havel was as much a politician who wrote plays as a playwright who became involved in politics. It is inaccurate to idealize and romanticize Havel's life as a dissident or to look at his subsequent political career simplistically as a steady decline from artistic purity into the irredeemably compromised world of intrigue, manipulation and power. "President Havel has made Czech people very proud and certainly made me very proud of having been born Czech and I think he will be very very missed on the international scene. There will be an adjustment in many ways because to a lot of people the word "Havel" and "Czech" are synonymous. Havel really put the Czech Republic and Prague on the map in the post-Cold War period." Former US Secretary of State, Madeleine Albright, Prague, November 2002. Havel has always been a political animal. In order to survive as a dissident he had to be. His great political rival during the thirteen years since the fall of communism, the former Czech Prime Minister and now President Václav Klaus, is one politician who is well aware of this fact. The political sparring-matches between the two men shed a good deal of light on Havel's political views. Václav Klaus is a party man and a pragmatist. He believes that parliamentary democracy must function exclusively on the basis of strong and clearly identifiable political parties. In Klaus's view the politician is accountable first and foremost to the voter. 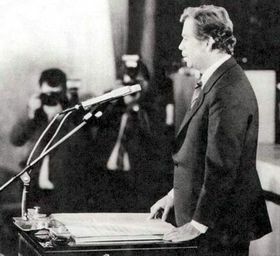 President Havel's political model is based on the principle of the individual, that the politician is accountable primarily to his own conscience. Havel often tried to weaken the political hold of the larger political parties. While for Havel this is a recipe for a "civil society" based on individual responsibility, Klaus described it as a means of creating an opaque political scene, based on who you know and what power you can wield behind the scenes. Klaus often pointed to the influence of Havel's unelected advisors at the Castle, while Havel often criticized Klaus as being so "pragmatic" that he was willing to sacrifice his moral principles and betray his voters' trust. This clash reached its peak in Havel's now famous address to both houses of parliament on 9th December 1997, a week after the collapse of Klaus's coalition government. Havel broadly condemned the government and was scathingly critical of Mr Klaus's leadership style. In return Klaus was just as scathing about the caretaker government that followed, which included a mixture of politicians and technocrats and in Klaus's view symbolized the dangers of taking politics out of the hands of party politicians. For Havel the role of President Masaryk in the First Czechoslovak Republic before the war is a model. Klaus argues that Masaryk - while he was undoubtedly a great statesman - used underhand methods to build a power base at Prague Castle and meddle in business of government. Václav Havel became president of Czechoslovakia on 29th December 1989 Václav Havel became president of Czechoslovakia on 29th December 1989 on a huge wave of popular support. Although his popularity oscillated over the following 13 years he always remained one of the most popular Czech politicians. But from the moment he became president, Havel was no stranger to controversy. Before he even took office his apology for the expulsion of Sudeten Germans from Czechoslovakia after World War II led to passionate political debate. The general amnesty, which he declared immediately after taking office, also came in for criticism. It was also in 1990 that some politicians accused him of being undiplomatic, when he offended China by inviting the Dalai Lama to visit Prague. The friendship between the two men has remained throughout Havel's period as president. As the political row between the political representatives of the Czech and Slovak Republics escalated during 1991, Havel was strongly opposed to the prospect of dividing Czechoslovakia. In December 1991 he unsuccessfully proposed legislation on a nationwide referendum, for the people to decide on the future of the country. In the parliamentary elections of June 1992, the Civic Democrats of Václav Klaus emerged as the strongest Czech party and the Movement for a Democratic Slovakia as the strongest force in Slovakia. It soon became clear that the two sides were worlds apart and would be unable to form a federal government. Almost within days they began negotiations on bringing Czechoslovakia to an end. In protest Havel resigned on 20th July 1992, and immediately withdrew completely from public life. Some of his political allies felt that this was a mistake, and that he should have fought to the end to save the federation. At the time Havel insisted that he would not stand as president of an independent Czech Republic, but as the division became a reality he changed his mind. 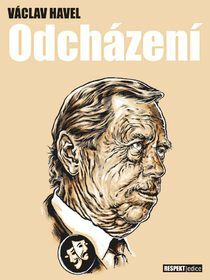 On 26th January 1993 Czech deputies elected Václav Havel to be the first ever Czech president. He continued to take an independent line, often to the frustration of Prime Minister Václav Klaus. At the time of the war in Bosnia, Havel was far more outspoken in support of international military intervention than Klaus's government. Havel also expressed strong support for closer institutionalized political cooperation between the countries of Central Europe. By contrast Klaus felt that cooperation should be restricted to the establishment of a free trade zone. In 1994 Havel hosted a meeting of seven Central European heads of state in the Czech town of Litomysl, to reinforce his message. 1996 was a difficult year for President Havel. In January his wife Olga died after a long battle with cancer. During his presidency she had been very active, far beyond the passive role of the "first lady". Her charity work was ground-breaking in the early years after the fall of communism. In December 1996 the chain-smoking Havel was diagnosed as having lung cancer. He underwent successful surgery to remove the greater part of one lung. Numerous articles about the "dying president" appeared in the international press, but in fact the president made an almost full recovery. By this time his close friendship with the actress Dagmar Veškrnová was no secret, and the two married in January 1997. Reactions to the marriage in the Czech Republic were mixed. While some saw it as a romantic fairy tale, others pointed out that Olga, his partner of 40 years, had died only eleven months before. In time, Dagmar Havlová came to be broadly accepted. Václav Havel with his wife Dagmar in 2011, photo: ČTK By 1997 serious cracks were appearing in the Czech economy, and the illusion that - unlike the other post-communist countries - the Czech Republic would not have to go through a period of painful economic transition, rapidly disappeared. In May President Havel was involved in another serious clash with Václav Klaus's government, claiming that it had lost its way and run out of ideas after free-wheeling for several years under the illusion that the "invisible hand of the market" could pull the economy into the 21st century. Mr Klaus was not amused. At the end of November 1997, the fragile Klaus government collapsed, and Havel was instrumental in putting together the caretaker government that replaced it. On 9th December he launched a further attack against Klaus's political style in a speech to both houses of parliament. Havel was reelected as Czech President on 20th January 1998, but by this time he had plenty of political enemies in parliament. He was only elected in the second round, and by a majority of only one vote. It was a political shot across the president's bows. In the spring of 1998 Havel clashed openly with the Social Democrats, then still in opposition, but on the verge of coming to power the June general election. He accused them of playing with fire in their demands for a referendum on NATO membership, and the outspoken Social Democrat leader, Milos Zeman, responded by accusing Havel of arrogance, given the fragile majority by which he had been elected. Tensions with Zeman's Social Democrats and Klaus's Civic Democrats continued after the June parliamentary elections. Havel made no secret of his fierce opposition to the so-called "opposition agreement", under which the Civic Democrats agreed to tolerate the Social Democrat minority government. As Havel became more involved in day-to-day party political rows, his popular support fell and an opinion poll published in January 1999 suggested that for the first time he enjoyed the trust of fewer than fifty percent of Czechs. In March 1999 the Czech Republic joined NATO. Havel was one of the strongest supporters of NATO membership and alliance leaders hinted that his international moral authority was one of the factors in deciding to admit the Czech Republic. Ironically, in the early days after the fall of communism, Havel had spoken in favour of dissolving both the Warsaw Pact and NATO, and having a Europe free of military pacts. He later openly admitted to having changed his mind. Within weeks of joining NATO, the Czech Republic faced its first test in the alliance, as military attacks were launched against Serbia over Kosovo. 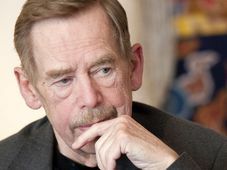 Many Czech politicians were hesitant in supporting the intervention and gave mixed political signals, but Havel expressed his full support, saying that the attacks were "absolutely essential in the given situation". His political battle with the two largest political parties, the Social and Civic Democrats continued, as the two parties contemplated pushing for constitutional changes that would severely restrict the president's powers. Havel said that he did not want to become a "mechanical puppet". At the end of November 2000 President Havel exercised one of his real powers in appointing a new governor, vice-governor and governing board of the Czech National Bank, against the will of the government. The Constitutional Court upheld Havel's decision. In the last years of his term of office, President Havel did not appear frequently in public, and engaged actively in political debate only on occasions - such as with the appointment of the Czech National Bank governor - where he has felt he could exercise real influence. His absence was felt most strongly during the drastic floods of August 2002, when Havel returned from holiday at his villa in Portugal only after the floods had been raging for several days. Looking at President Havel's period in office as a whole, there is no doubt that his departure left a huge vacuum on the Czech political scene. Madeleine Albright was undoubtedly right when she said at the end of his last term as president: "There will be an adjustment in many ways because to a lot of people the word "Havel" and "Czech" are synonymous. Havel really put the Czech Republic and Prague on the map in the post-Cold War period." After leaving office, Václav Havel engaged far less frequently in Czech public life and political debate, although he continued to embody a very different version of the Czech Republic than his successor Václav Klaus. From 1997 onwards he hosted the annual Forum 2000 international conference, which over the years has been attended by some of the world’s most influential democratic politicians and thinkers. Havel continued writing, and to general surprise, in 2007 completed his first play for nearly two decades, “Leaving”, which, with typical self-irony, looks at the life of a prominent politician after he leaves office and finds himself losing his former power, influence and privileges. In the last years of his life, he was increasingly frail and his public engagements became less frequent. 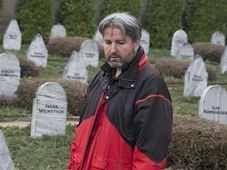 The problems of the Havel family began in 1939 with the Nazi occupation and continued in the years that followed the war. With the communist coup of February 1948 the family lost most of its remaining wealth. In 1952 they had to leave the Lucerna Ballroom, which they had been allowed to continue managing after it was confiscated three years before. The "bourgeois" Václav was not allowed to study anything connected with the arts. The regime wanted engineers and technicians, and the shrinking arts and human science faculties were almost exclusively the reserve of the Communist Party. So for two years Havel studied at the Czech Technical University in Prague. Václav Havel with his wife Olga He was interested in poetry and theatre from the start, and as a teenager his favourite writer was Franz Kafka. Havel was 20 when he met Olga Splichalova, and they would meet almost daily in Prague's Café Slavia. Her roots could not have been more different from his own. She grew up in great poverty in the working-clas suburb of Zizkov, but the two always insisted that their differences provided an ideal complement to one another. 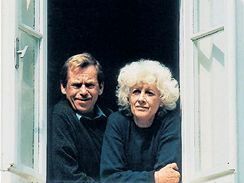 Throughout their marriage - until her death in 1996 - she was always the person who read Havel's writings first, and who most supported both Havel himself and the dissident movement he represented. Havel's later "Letters to Olga", which he wrote from prison, have become one of his most widely read books worldwide. A formative period at this stage in Havel's life was his military service. He was confronted with a tough world, far removed from the largely detached life of Prague's literary and social elite. It was during this period that he also made his first experiments with theatre, and he has always drawn on the experience as a positive one. Havel began to write plays in earnest in the late 1950s, working as a scene-shifter and stage technician at Prague's ABC theatre. This was a time when Czech theatre was just emerging from the straightjacket of Stalinism, and was beginning to feel the stimulating influences of the "Theatre of the Absurd", above all of Eugene Ionesco and Samuel Beckett. This sense of the absurd appealed to Havel, and has remained central to his writing. In 1960, Havel moved on to the Theatre on the Balustrade, and at the same time studied drama by correspondence at the Faculty of Theatre at the Academy of Musical Arts. He wrote "The Garden Party" in 1963 and this was performed at the Theatre on the Balustrade, as was "The Memorandum" of 1965 and "The Increased Difficulty of Concentration" of 1968. This period was marked by a significant loosening of the communists' tight political grip and it also marked the beginning of Havel's political engagement. He became chair of the Club of Independent Writers and was on the editorial board of the non-Marxist cultural monthly, "Tvar". There were endless political debates, but at this time Havel's political battles were largely restricted to the cultural sphere. This changed in 1968. 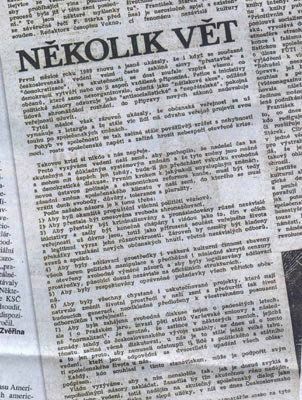 In April, at the height of the Prague Spring, Havel wrote an article for the literary weekly "Literarni listy", that was considered daring even for the period of "socialism with a human face". In the article he called for political plurality and an end to one-party rule. The suppression of the Prague Spring brought an end to any idea of staying outside politics. Havel was active in the discussion that led to the writing of the manifesto "Ten Points" in July and August 1969. The document condemned the Warsaw Pact invasion and the new order that was being put into place. Not surprisingly Havel rapidly became a "banned" writer. His books and plays could no longer be published or performed and were withdrawn from libraries. In 1970 he was publicly condemned on Czechoslovak TV and Radio, as well as in the party newspaper Rudé Právo. He had become a dissident, with all that the label implies. Havel's next major initiative was his "Letter to Husák" of 1975, an open letter to the Czechoslovak president. The letter was a passionate appeal for a halt to the process which the communists euphemistically called "normalization", under which the population was bullied into accepting the new order through fear. The letter is a brilliant description of the time. Unlike in the 1950s, people were not afraid for their lives. Instead the regime encouraged people to retreat into the security of their family lives. Using a carrot-and-stick method, the communists offered material security and a rising standard of living in return for quiet obedience. The alternative to obedience was complete social exclusion: "For fear of losing his job, the schoolteacher teaches things he does not believe; fearing for his future, the pupil repeats them after him; for fear of not being allowed to continue his studies, the young man joins the Youth League and participates in whatever of its activities are necessary; fear that under the monstrous system of political credits, his son or daughter will not acquire the necessary total of points for enrolment at a school, leads the father to take on all manner of responsibilities and "voluntarily" to do everything required." The overall illusion created, wrote Havel, was of a society completely united behind its leadership. In the letter, he also criticised the communists' gradual suppression and rewriting of history. Like other dissidents, he was depressed by the passiveness of many citizens, and tried to battle for a new atmosphere. 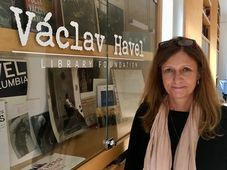 Instead of succumbing to the fear that had been drilled into Czechs and Slovaks since the 1950s, it was necessary to take risks and to stand up to those in power. One of Havel's central principles as a dissident was the appeal to people to live in a state of inner freedom, to try to behave as if they lived in freedom. It was a simple idea, but a liberating one. 1976 saw a further grotesque episode in the history of "normalization". Musicians from the experimental band "Plastic People of the Universe" were arrested. An absurd, but highly symbolic trial began, that shed light on the extent to which the regime was willing to suppress cultural life and left foreign journalists who were observing the trial flabbergasted at the Kafkaesque nature of the regime. Havel and other dissidents were hesitant before becoming involved, because The Plastic People were musicians, not political dissidents, and the involvement of dissidents would instantly politicize the whole debate. But it soon became clear that this was a political issue, and the trial became a rallying point for a hugely diverse cross-section of people unhappy with the regime - from rock musicians to Roman Catholic priests. In this respect, it paved the way for the most famous initiative of the dissident movement, Charter 77. Charter 77 was very much Havel's baby, although he did not write it alone. It was an appeal to the government to respect the basic human rights and freedoms to which Czechoslovakia had committed itself with the International Covenant on Civil and Political Rights signed in Helsinki in 1975. 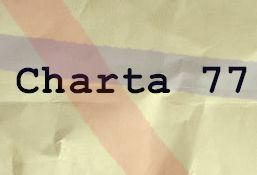 By 5th January 1977 when Charter 77 was published, it had 242 signatories. The regime launched a vigorous campaign against this "anti-socialist", "demagogical" document, and not surprisingly Václav Havel found himself behind bars for the first time is his life, charged with trying to subvert the state. He found it hard to cope with prison and appealed to the authorities to release him. When they told him that his fellow dissidents had abandoned Charter 77, Havel accepted that the Charter was at an end and agreed that he would have nothing more to do with it. On his release in May Havel discovered that they had lied to him and that Charter 77 was alive and well. He wrote an article in which he explained how the authorities had deceived him. At the same time he was critical of himself for his naivety in believing them and for what he perceived as his own cowardice in the face of pressure. From August 1978 Havel was under constant police supervision and the police did all they could to try to bully him into emigrating. It was only a matter of time before he would be arrested again. In April 1979 he was co-founder of the Committee for the Defence of the Unjustly Oppressed, the aim of which was to help dissidents and their families to cope with the material, financial and psychological pressures they faced. A month later, sixteen members of the committee were arrested, including Havel. Havel refused an offer to emigrate to the United States, and in October 1979 went on trial. It was claimed that the Committee for the Defence of the Unjustly Oppressed was an illegal and anti-socialist organization. Amid huge international protests Havel was sentenced to four years in jail. Out of solidarity theatres around Europe (including Warsaw) staged productions of his plays. The "Letters to Olga" date from this time. After his release in 1983 Havel spent most of his time at his country cottage Hrádeček in North-Eastern Bohemia, and it was there that he wrote his most acclaimed work "Largo Desolato". In the wake of Havel's four years in prison, there is a strongly autobiographical element to the play, which deals with "post-prison psychosis". In the mid and late 1980s Havel became increasingly drawn into politics and found less and less time for his writing. Although at the time he certainly did not dream that in a few years he would be president, this period was a good preparation for his later career. After Mikhail Gorbachev launched the process of "perestroika" in the Soviet Union, the Czechoslovak hardliners gradually began to lose their grip. A whole string of important political figures from abroad came to Prague, and as well as meeting representatives of the regime, they also had open meetings with Havel and other dissidents, culminating in President Mitterrand's now legendary breakfast with dissidents in the French Embassy in 1988. In October 1988 Havel was involved in writing the manifesto "Democracy for All" which was much tougher in its wording than Charter 77. It called for an end of the leading role of the Communist Party. At the time this was not quite such a far-fetched demand as it may seem. Not long beforehand, the Hungarian parliament had passed just such a resolution. The manifesto was enough to inspire the increasingly nervous and uncertain authorities to arrest Havel on 27th October, the day before the 70th anniversary of the foundation of Czechoslovakia. Around 5000 people gathered on Prague's Wenceslas Square to commemorate the anniversary, but police dispersed them using force. In the public awareness this destroyed any faith people may have had that the regime was committed to "perestroika". Havel was released and one day after his breakfast with Mitterrand, on the 10th December 1988, he was allowed to address the first officially permitted demonstration - on Prague's Skroupovo Square. The communists - by now behaving in a way that was increasingly hysterical and unpredictable - clamped down again a month later at the time of the twentieth anniversary of the death of Jan Palach, who had burned himself to death in protest against the Soviet occupation in January 1969. They arrested a group who were laying wreaths at Saint Wenceslas' statue. Havel was watching from a distance, but this was enough for him to be arrested as well. At his trial on 21st February 1989, Havel was found guilty and sentenced to nine months, for the "crime" of standing in the street. Summing up his defence Havel said: "I hope that the state apparatus will soon stop behaving like one of the ugly sisters, who breaks the mirror because she blames it for what she sees." After a massive petition was launched, Havel was released in May. Havel was the driving force behind the next manifesto, entitled "A Few Sentences", again appealing for reform. This time 30 000 people signed, a sign of the growing momentum of protest. Havel was not in Prague on the day that marked the beginning of the Velvet Revolution, the 17th November 1989. He had deliberately decided to go to Hradecek on the day a student demonstration was called to remember the student leader Jan Opletal, killed by the Nazis in 1939. The wave of protests that followed the violent police suppression of the demonstration was the catalyst for the fall of the regime, which collapsed within days like a house of cards. Two days later, on 19th November, Civic Forum was founded at the Cinoherni Klub theatre. Havel was there, and although he was no master of public speaking, it was soon clear that he was able to unite the diverse forces that had come together to call for change. His years as the key figure in the dissident movement had prepared him as a negotiator and he showed an ability to articulate what people were feeling but were unable to express. Although he had previously been almost unknown to the broader public, he immediately became the central figure of the Velvet Revolution. On the 22nd November, he first addressed the crowds on Wenceslas Square from the balcony of the Melantrich publishing house. At talks with the communist Prime Minister Ladislav Adamec four days later it was clear that the battle was already won. It is unlikely that Havel actively sought the presidency, and it is clear that Olga was actively opposed to the idea of her husband being swept up to the Castle. She jokingly threatened to divorce him. However, the idea began to circulate very early on during the Velvet Revolution. It became clear that the president would have to be either Havel or Alexander Dubcek, the veteran leader of the Prague Spring. Dubcek made it clear that he wanted the job, but nearly all the leading figures in Civic Forum rapidly came to the conclusion that he had been out of politics for too long. He gave the impression of an old man, broken by the disappointments of his past. By contrast, Havel was highly charismatic and at the centre of events. Civic Forum chose Havel as their presidential candidate and left it to Havel to break the news to Dubcek - one of the painful moments of the Velvet Revolution. On December 28th Alexander Dubcek was elected Chairman of the Czechoslovak Federal Assembly and on December 29th parliament (ironically at the time still dominated by communists) elected Václav Havel as President of the Czechoslovak Socialist Republic.